There are over one hundred different species of snakes in North America, of these, just under twenty of them are actually dangerous. Play it safe, treat all snakes as if poisonous! Be prepared, find a vet that has anti-venom available. Be prepared for the cost, most anti-venom shots are around $1000 and most times, more than one is needed in addition to tests and basic vet costs. Now would be a good time to think about health insurance for your pet. Click here to see what insurance companies will cover a pig. It is important to know the kind of snakes that live in your area and how they will behave when you come upon them. 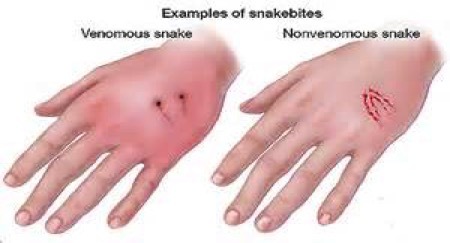 If there is a snake bite and you have any doubts; Seek medical attention immediately! 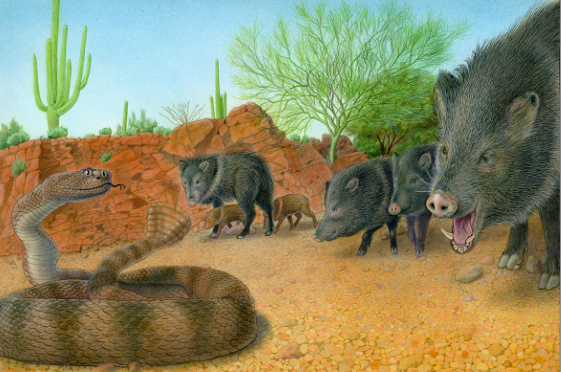 Snakes CAN bite pigs, typically, pigs have a lot of adipose tissue (fat) and the venom doesn't/isn't able to reach the blood stream where it would normally circulate through causing havoc. It can happen, but its rare. Contain your pet to avoid being bitten – snakebites can be painful, and your pig may try to protect herself. Immobilize the part of the animal that has been bitten by the snake, if this can be done safely. Try to keep it at or below the level of the heart. Keep the pig calm and immobile; carry if necessary and if you can. Try to identify the snake if it can be done without risk: DO NOT ATTEMPT TO CAPTURE OR KILL THE SNAKE. It is helpful to identify the type of snake to aid your veterinarian with treatment. Do not bring the snake into the veterinarian’s office – a photograph will do. Do not administer any medications except on a veterinarian's advice. Snakebite is a complex problem. The severity and type of damage done by venom depends on the type of snake involved, the age of the snake, and the size of the pet who was bitten. The vast majority of pets who are bitten by a snake will survive, but medical attention is vital to ensure the best outcome. Some snakes have venom that causes severe shock and rapid death. Others have most of their effect on the muscles or have effects that can be delayed by days or weeks. Some venom is concentrated and some isn’t, thus requiring a large quantity before damage is done.The first goal in snakebite treatment is to keep the venom from circulating in large quantity throughout the body. However, keeping all the venom in the area of a bite (as happens with ice packs or tourniquets) may cause severe muscle damage. Antivenin administered at the hospital is the most direct and helpful treatment for your pet. Antivenin can cause severe allergic reactions in some pets, and must be administered under controlled conditions and monitored closely. Most pets that have been bitten will need to be admitted to the hospital for treatment, and some pigs can have large areas of dead tissue that need to be surgically cleaned over several days or weeks. If your pig is bitten by a snake, assume the bite is venomous and seek veterinary attention quickly. For most people, there are no foolproof methods to always tell if a snake is venomous. Even harmless snakes have colors, triangular heads, and shake their tails. There are a few major identifiers that will be covered and there are exceptions to them. Treat every snake as if poisonous. Do not put yourself at risk to identify a snake. Do no put yourself at risk to catch the snake. Just take a photo. Eye shape: most, not all, venomous snakes have an elliptical pupil much like a cat eye. Head shape: to most people all snakes look to have a triangular head, because basically, the do. 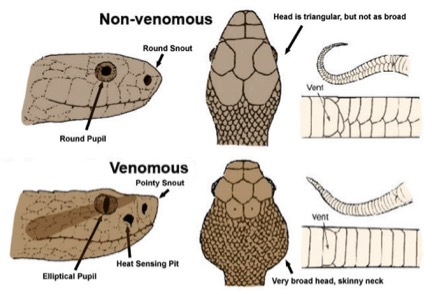 to allow for the glands that produce and hold the venom a poisonous snake will have a broader base to the head which gives the body a thinner appearance at the “neck” area as compared to a non-venomous. Look for the heat sensor: most venomous snakes in the u.s. will have a small depression between the eye and the nostril. this is called a pit, which is used by the snake to sense heat in their prey. coral snakes lack this feature as they are not pit vipers. Look and listen for a rattle: if the snake has a rattle on its tail it is a rattlesnake, and therefore venomous. however, some non-venomous snakes do mimic the rattler by rattling their tails, but lack the rattle "buttons" that sound like little salt shakers. 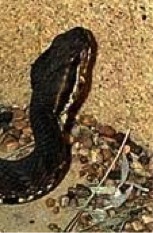 Examine the bite marks: two close-set puncture marks would indicate that the snake has fangs and is venomous. by contrast, a ragged bite mark means the snake lacks fangs, which only non-poisonous snakes have. Although the example is on a human hand, the bite marks should be similar on a pig. Snakes are cold blooded, which means their body temp changes with the outside temperatures. Look for them in cool, dark, and damp places during the summer months. They are more active in the spring during mating season. When the weather turns cold most snakes hibernate. They will go to hollow logs or even dens. Most snakes will go to the same den, if available, and it is not unusual to have multiple snakes in one den. They can number from a few dozen to hundreds depending on the type of snake and your general geographic location. 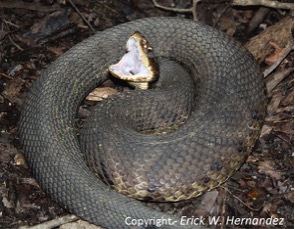 The cottonmouth has elliptical pupils and range in color from black to green. They have a white stripe along the side of their heads. they are often found in or around water, but have also adapted to live well on land. They are often loners, so if you see multiple snakes coexisting peacefully, it is probably not a cottonmouth. Only a cottonmouth can swim on the surface and they can bite while swimming. 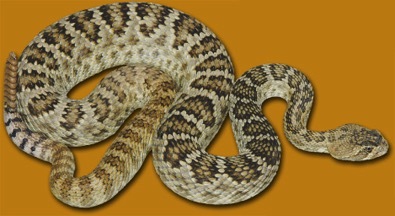 There are about 30 different varieties of rattlesnakes in the world. Look for the rattle on the tail, it is very distinctive. You will know it when you see it. 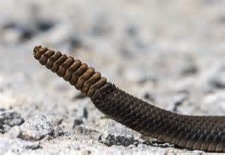 Some harmless snakes imitate the rattle by brushing their tails through leaves, but only rattle snakes have the button-like rattle at the end of the tail. If you can't see the rattle, they also have a heavy triangular head and elliptical eyes like a cat's. Rattlesnakes (family Viperidae) are most common in the Southeast and Southwest, but can be found in nearly all areas of the country. followed by cottonmouths (Agkistrodon piscivorus, a.k.a. water moccasins), and copperheads (Agkistrodon contortrix). Rattlesnake bites are poisonous to all pets and farm animals. Symptoms of envenomation include difficulty breathing, bruising, cardiovascular shock, and in serious cases, organ failure. Treatment often includes intravenous fluids, antibiotics, transfusions, anti-venom and blood parameter monitoring. Something to keep in mind is that about 25 percent of rattlesnake bites are “dry,” meaning that venom is not released, but immediate veterinary attention is always recommended. 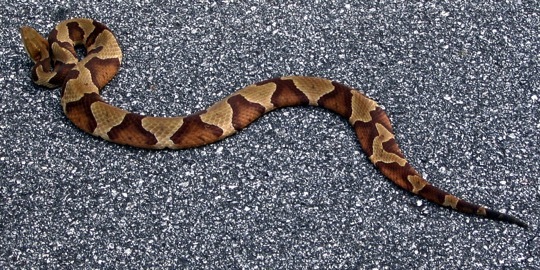 Copperheads are some of the more commonly seen north american snakes. They are also the most likely to bite because they will do so immediately upon being threatened and will give no warning. Their bite is relatively mild as they rarely deliver a full dose of their venom and is rarely fatal in larger animals. They have been known to bite repeatedly which poses more of a danger and would be more likely to result in death. While there are several snakes that resemble a copperhead, they are the only kind of snakes with hourglass-shaped markings. Beautiful but deadly. Most of the time coral snakes will not bite, they are very shy. There are no known deaths from the arizona coral snake and only a few from the eastern coral snake. The coral snake is the only non-pit (no indent or pit in the nose for heat sensing) viper in the usa. It has a very small mouth so larger animals are usually never bitten. However, there is no pain from the venom until it effects the nervous system causing breathing paralysis. Coral snakes(family Elapidae), commonly found in the Southeastern United States, are very poisonous to all pets and farm animals. The saying “red next to black is a friend of Jack; red next to yellow is a dangerous fellow,” applies to their colorful ringed bands. 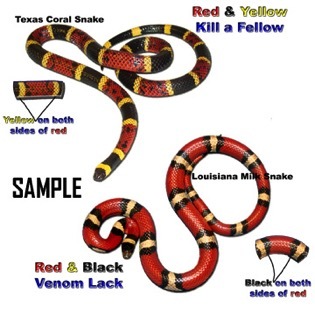 Coral snake venom contains neurotoxins that can cause respiratory failure and muscle paralysis. Symptoms are acute paralysis (not being able to move or walk), problems breathing, and sometimes collapsing. Treatment typically includes supportive measures, particularly respiratory. Anti-venom is effective, but not readily available. Pit Vipers (subfamily Crotalinae) and are generally considered to be the most dangerous. They belong to a subfamily (Crotalinae) of the family Viperidae, that have a small depression on each side of the head between the eye and the nostril, and that have hollow perforated fangs usually folded back in the upper part of the mouth but erected in striking. Not only are these snakes venomous they also have a very 'cool' heat sensing system. This helps these snakes to find prey in the dark, which is when most snakes like to hunt. The ‘pit’ is a special organ in between the eyes and the nostrils. The pit senses body heat from animals and gives the snake a ‘picture’ of that animal. The snake can then attack it. Some pit vipers will bite and poison the prey and then release it. It will follow the dying animal, using its heat sensors, until it stops and the snake can swallow it. Most pit vipers hunt at night when the air is cooler and the heat from rodents and other prey is most obvious to them. The ‘heat picture’ from larger animals will tell the snake that a quick escape is a good idea, too! Special thanks to Cat Drose for researching the dangerous snakes and creating a document for the website. ​Most spider bites cause only minor injury. A few spiders can be dangerous. ​In the United States, these include the black widow spider and the brown recluse spider. This spiders habits are exactly what the name is, reclusive. This spider lives in dark corners and places inside the houses, and also under the furniture, boxes and books. It has a rather shy and nonaggressive behavior, although occasionally the Brown Recluse Spider bites human because they share the same habitat. At the same time, they also share the same habitat as your pets, including pigs. Inside homes, the arachnid lives in dark places, such as cracks, corners, seldom used clothes, curtains and inside furniture. Yet, it is very common for a spider to get trapped in showers and bathtubs because of their smooth surface, and there have been lots of cases in which spiders bit the legs of a person who was having a bath. Outdoors, the BRS is usually located underneath rocks or within hollow woods. 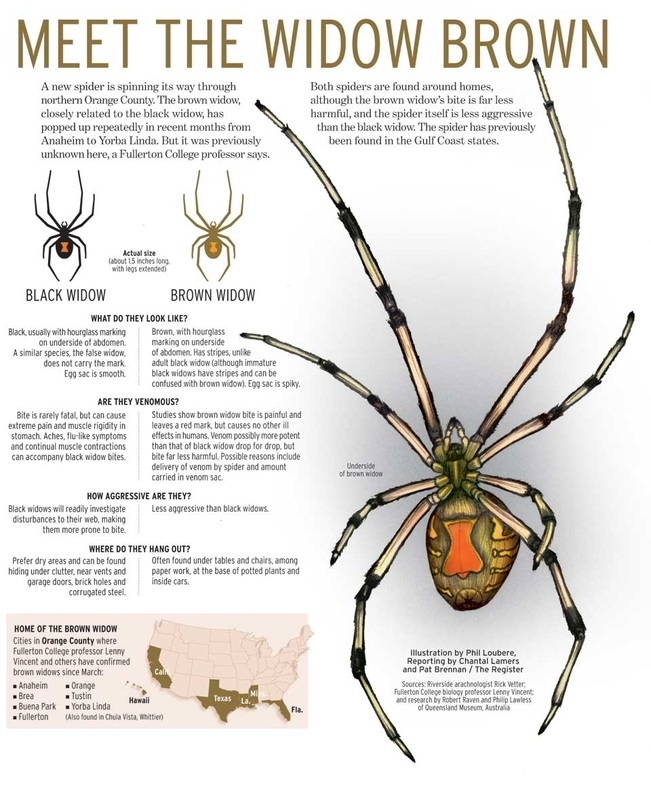 These spiders are mainly found in the central Midwestern states southward to the Gulf of Mexico, especially in Oklahoma, Arkansas and Missouri. Important: These spiders can and do spread, travelling inside boxes and packaging. Inside homes, the brown recluse spider can be found in any of the following places: dark spots within baths, dormitories, garages, closets and cellars, vent and heating conducts, seldom used clothes/shoes. They can nest in stored clothes, old books, boxes, furniture, toys, carpets, coatings, corners and cracks. Typical outdoor habitats of the brown recluse spider: storage places, underneath rocks or inside hollow trunks. Houses are the common habitat of this kind of spider. 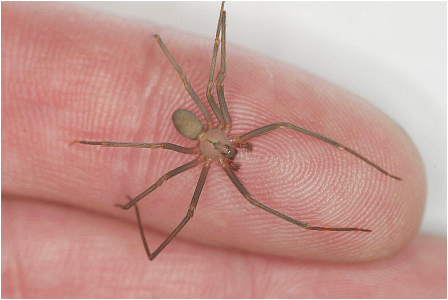 Shy, lonely and sedentary, the brown recluse spider develops its activity during the night. It can be found in buildings, weaving its web in high and dark corners and behind paintings or closets. The bite of this spider is just a self defense mechanism. We can find it throughout the year but most cases occur in summer and spring. The bite, in general, is the result of pressing the spider with the skin during the night when the person sleeps (38%), or when people get dressed (32%) with clothes that were hung on walls or closets for a long time. Normally, the bite can be found on the face and the extremities. Some people, generally adults, are bitten by a BRS without consequent pain or inflammation; this goes inadvertent for some, although most victims have immediate signs of being poisoned. The poison causes the necrosis (death) of the soft tissue that starts as a local inflammation with reddening, edemas and pain. The venom is a flesh eating enzyme and there is no antidote. General symptoms are: fever, shivering, nausea, vomits, itching, restlessness and state of shock. The injury is usually of 1 to 2 3/4 inches and it becomes evident with the appearance of an ulcer, which can take several months to heal and generally leaves unattractive scars. All that can be done is symptom control, fluids, pain control, localized wound care, antibiotics for any secondary infections. ​Black widows are identified by red hourglass marking on the underside of their abdomens. Black widows are shiny black in color. Most black widow spiders’ bodies are 3 to 10 mm in size. Females are larger than males and can measure 13 mm in body length. These spiders are members of the genus Latrodectus. Black widow spiders favor dark, secluded areas such as crevices and woodpiles. Inside the home, black widows typically hide in sheltered, dimly lit locations such as garages, dark corners, basements, closets and cluttered areas. 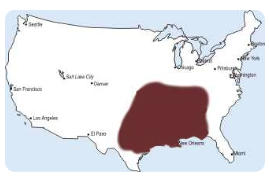 They thrive primarily in temperate zones and are known to be abundant in the American South. An important characteristic of the black widow spider is its comb foot. This row of strong, curved bristles is located upon the hind pair of legs and is used to pitch silk over captured prey. Black widows are shy in nature. They are solitary, socializing only during copulation. Black widows are nocturnal and spin webs during daytime. They can sometimes be seen hanging upside down in their web, exposing a telltale hourglass abdominal marking. This marking is bright red and signals danger to predators and attackers. Several species of Latrodectus or “widow” spiders are present in North America. The most common are: the southern widow (Latrodectus mactans) found in the American South and Northeast; Latrodectus hesperus found in the west; the brown widow (Latrodectus geometricus) found in the South; and the northern widow (Latrodectus variolus) found in the Northeast. 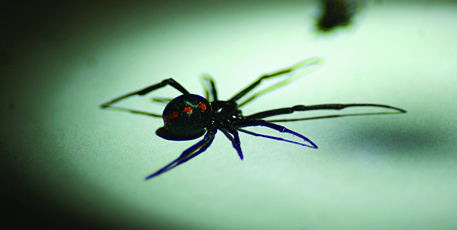 Black widows produce messy, irregular webs. Webs usually are located near ground level and under a protected ledge such as under lawn furniture or wood piles. The female with the iconic red hourglass marking also indicates their presence. Species of widow spiders are also occasionally transported in shipments of household goods to states outside of their natural range. Northern black widows are primarily found in marginal land habitats with sparse vegetation, stumps, hollow logs and piles of debris. Northern black widow spiders are rarely found indoors. However, they may enter human dwellings on piles of firewood or other items brought inside. Most adult female northern black widow spiders are shiny black in color, with rows of red spots atop the abdomen. Crosswise bars that resemble a red hourglass appear on the underside of the abdomen. Clean the wound. Use mild soap and water and apply an antibiotic ointment. Apply a cool compress. Use a cloth dampened with cold water or filled with ice. This helps reduce pain and swelling. If the bite is on an arm or leg, elevate it. Your pig may not be this agreeable, and you may struggle with putting compresses on your pig period, do the best you can do. Use over-the-counter medications. Try a pain reliever, such as acetaminophen (Tylenol, others) or ibuprofen (Advil, Motrin IB, others), or an antihistamine (Benadryl, Chlor-Trimeton, others). The person who was bitten isn't breathing.